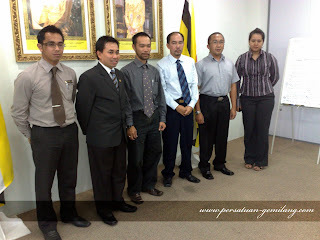 January 14th, 2010 - Tutong District Office yesterday received donations for the Humanitarian Fund for Victims of Flood and Earthquake in Indonesia from the Tutong District Gemilang Association and Cityneon. 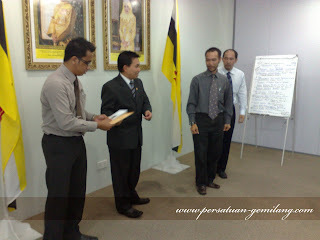 The hand over was held in conjunction with the Tutong District Carnival held from December 4-6, 2009. Twenty per cent of the $1,067.52 collected from the Tutong District Carnival was handed by the treasurer of the Tutong District Gemilang Association, Awg Zamain bin Sia, to the Acting Tutong District Officer, Hj Muhammad Suffian bin Hj Bungsu at the Johan Pahlawan Meeting Room, Tutong District Office. Also attending the event was Pg Md Bakhtiar bin Pg Hj Ibrahim, administrative officer and committee member of the Tutong District Gemilang. AGM GEMILANG 2010 berjalan lancar.